Note from Missy: Below is a guest post by my friend Gena Philibert-Ortega on using community cookbooks to further your genealogical research. How fun it would be to discover a new-to-you recipe once cooked by an ancestor or relative. Enjoy! 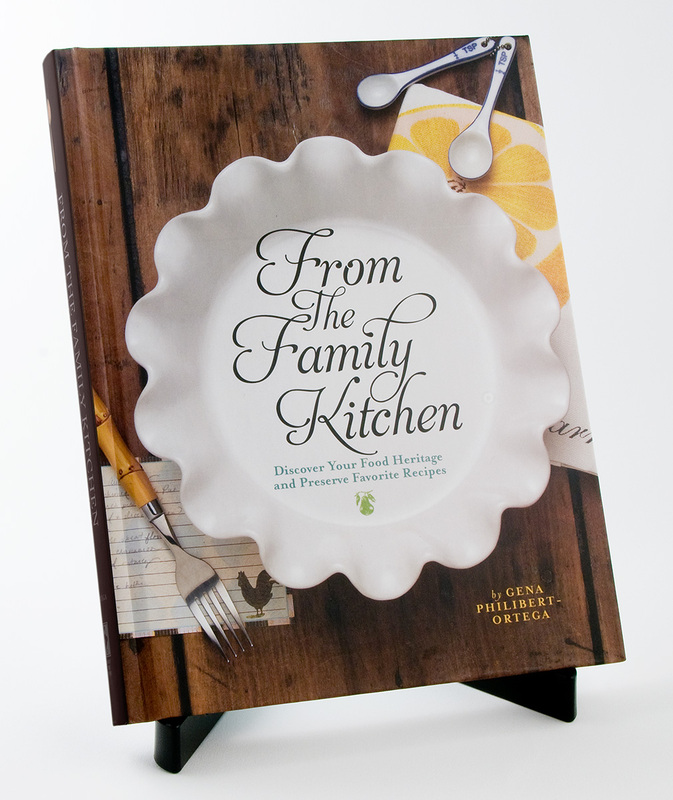 During this week of guest posting about food and family history, I’ve mentioned the importance of community cookbooks. In my opinion, community cookbooks are an important source that is overlooked in genealogical research. Researching these cookbooks can yield names, addresses, photos, ethnic origins and family history. In addition to the information about an individual family member you also glean clues about the organization that published the cookbook, their history, local business advertisements and other gems. In one church cookbook where I found a list of those buried in the church cemetery. This type of information can help you recreate your female ancestor’s community. Community cookbooks like other genealogical documents do have their down side, they can be difficult to find. Many repositories have not considered them worthy of archiving so to find a collection for your ancestor’s locality can be difficult. To begin your search, as with any genealogical search, start with the homes of relatives. In some cases they may have a copy of a cookbook that they or another family member contributed to. From there consider checking available bibliographies, archival/library collections, digitized book sites and online auction websites. If you are in the area where your ancestor lived, you can expand your search to local library collections, used bookstores, antique and thrift stores. Cook, Margaret. America’s Charitable Cooks: A Bibliography of Fund-Raising Cook Books Published in the United States (1861-1915). Kent, Ohio, 1971. While a library or archive in your ancestor’s locality might hold the promise of a collection of community cookbooks, another place to search is an Internet auction site like eBay. Community cookbooks are well represented on eBay. 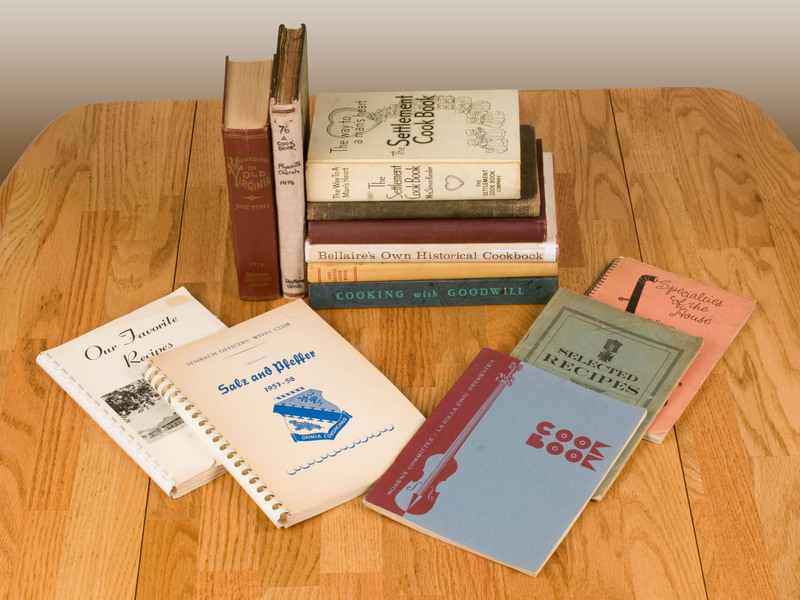 These cookbooks run the gamut of church, school, and organizational books spanning the 19th and 20th century. When searching on eBay, make sure to try various keywords so that you search can be as comprehensive as possible. Some search terms to try include “community cookbook” “church cookbooks” or “charity cookbooks” “fundraising cookbooks.” You can also specify a type of cookbook in your search like “Grange Cookbook” or “Methodist Cookbook.” Consider creating an alert for an ancestor’s locality, church, membership organization or a cookbook search to be notified by eBay when new items come up for sale. One book that explores community cookbooks is the book, Recipes for Reading: Community Cookbooks, Stories, Histories edited by Anne L. Bower. A preview of this book is available from Google Books. I’m indifferent to fruitcake. I guess my mom never cared for it, because we almost never had any. I think I can remember one instance of receiving one, but honestly, isn’t fruitcake like Chia Pets and the Clapper now? Who actually buys them? I remember the occasional Christmas cookie bejeweled with the same green and red candied cherries to be found in fruitcake, but that’s about as close as I’ve come to eating one. I think the cherries are pretty, but they’re not my favorite thing in the world. I’m generally not a fan of most dried fruits and usually don’t go out of my way to put nuts in anything I bake either. That would put me on the “Foe” side. However, I think it’s traditional to soak fruitcakes in rum, is it not? Can anything soaked in rum be that bad? This is post #8 for the Advent Calendar of Christmas Memories. Okay, so I got the appetizer out of the way. Now, I’m skipping straight to dessert. One Christmas about a decade ago, while visiting my mom, I pored over her cookbooks, recipe cards and magazine clippings for the dishes I loved so much growing up. I was finally out of college, with a kitchen I could cook in, and I was desperate to recreate many of those dishes on my own. Among the recipes I copied down were several for cookies. Chocolate chip cookies were the standard throughout the year at our house growing up, but at Christmas… Oh, at Christmas. That’s when all the special recipes were made — gingerbread men, chocolate butter cookies (for the cookie press), peanut butter cookies with Hershey’s Kisses on top, molasses cookies, pfeffernüsse (literally, pepper nuts), almond crescents, we made them all. My all-time favorite holiday cookies always mesmerized me as a child, the way the powdered-sugared crusts of the cookies would split and crackle, revealing the dark chocolate yumminess inside. And all of this was topped with a nonpareil (Now, how do you pronounce that? Non-peril or Non-pair-eye?). I so wish I had a picture of these cookies. Hmmm… might just have to bake some, so I can take some pics. That’s the kind of sacrifice I’m willing to make for you, my readers. In the meantime, imagine these with these on top. Directions: Pre-heat oven to 375 degrees (F). Melt the butter and chocolate in a heavy saucepan over low heat; combine the sugar, flour and baking powder in a large bowl; add the chocolate mixture, eggs and vanilla; mix until smooth (will be thin). Cover and chill for 2 hours. Roll into 1-inch balls and roll these in the powdered sugar. Bake 2 inches apart on lightly greased cookie sheets for 10-12 minutes. 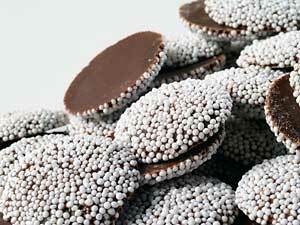 Press one nonpareil onto each cookie as soon as they come out of the oven. This post/recipe is my contribution to the GeneaBloggers 2009 Holiday Recipe Cookbook. My all-time favorite holiday family recipe has earned me quite a rep among those I’ve met at the parties to which I’ve brought these tasty appetizers (actually, I’m now required to bring these to most tailgates, showers and other gatherings). Good thing they couldn’t be simpler. Some of my earliest memories of family gatherings feature these Sausage-Cheese Balls (alternatively dubbed Cheesy Poufs, Snausage Balls and Cheesy Sausage Nums Nums, by those who have had them). Below is my mom’s hand-written recipe card containing the recipe, which has an (almost) embarassingly small amount of ingredients and work involved. They can be incredibly messy to mix together, but the end result is well worth going through all that. I have made these with turkey sausage for those who don’t favor pork and they have come out splendidly. They are practically impossible to mess up. Too much Bisquick and you just end up with cheesy, sausagy biscuits instead of balls. No problem! Play it off like that’s what you meant to make all along. I believe that one of my aunts came across this recipe when she lived on the Eastern Shore of Virginia. Our family has enjoyed them ever since. 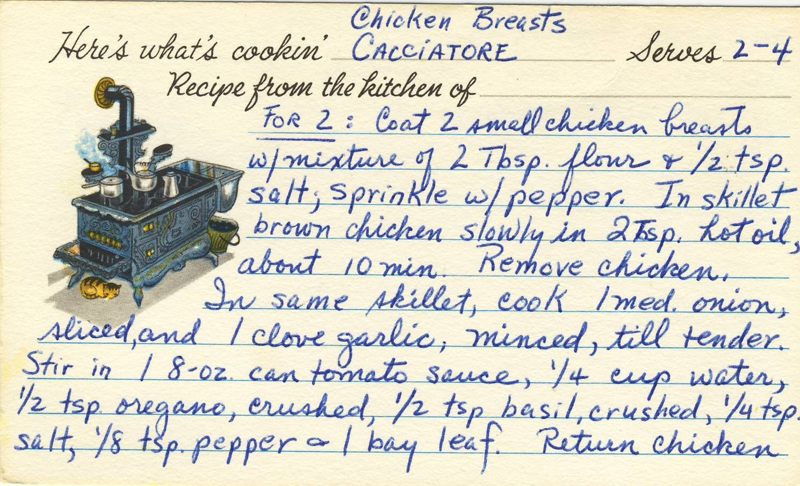 Some of my most treasured possessions are the hand-written recipes my mom and grandma left behind. I miss them both terribly, but can bring back wonderful memories of them by cooking their recipes. 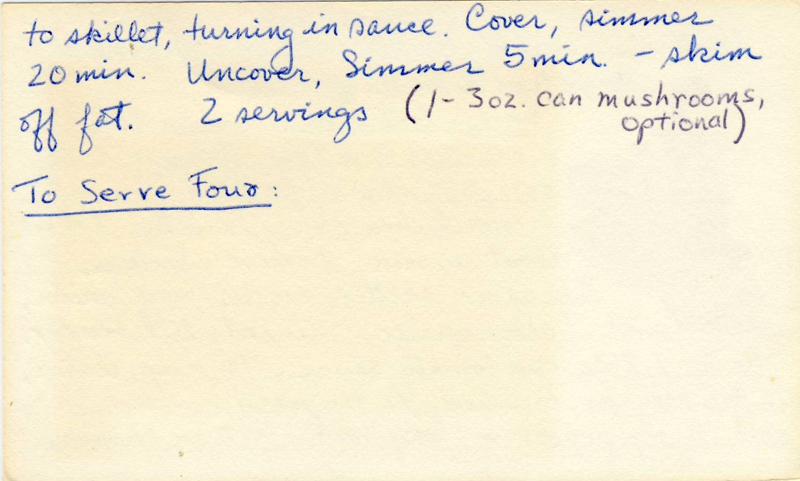 I recently started scanning many of these recipes into Creative Memories Memory Manager software, to make sure I’ll always have a copy. This has allowed me to start a digital cookbook in CM’s Storybook Creator software as well. I’ll be able to share this cookbook both online and in print form with friends and family when I’m done. If you’re interested in seeing my cookbook or learning how to create your own, please contact me!